My little butterfly is turning ONE! I usually try to homemake as much as I can. Being a mom of 2 sometimes it doesn't always workout that way. Although I love to make themed invites so I usually try to set aside the time for them. 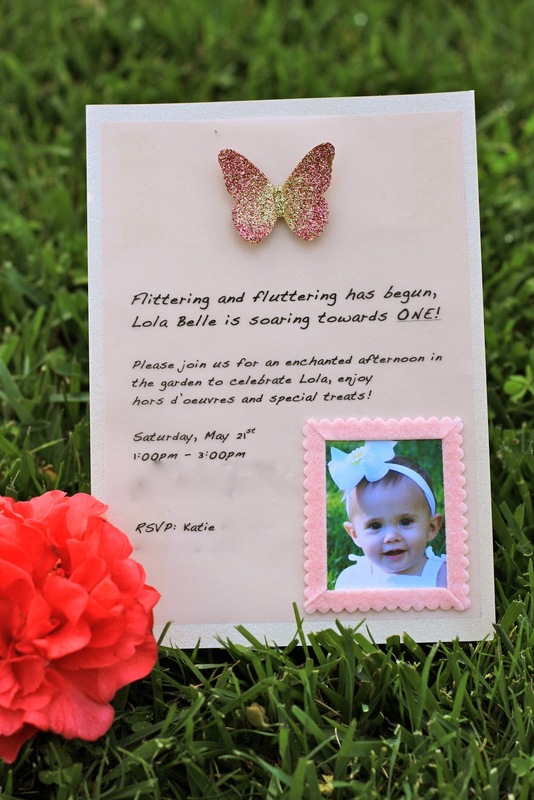 This year Lola's 1st birthday theme will be a gold and pink butterfly party. A large butterfly hole punch, thick gold cardstock paper, super fine pink and gold glitter, elmer's glue (or any similar glue), craft sponge, 3 small cupcake liners and a wood stick. 1. Punch out as many butterflies as desired, set aside. Place 3 small cupcake liners in a row. In the first liner pour a small amount of gold glitter and half as much pink. 2. In the second liner pour a small amount of gold glitter. Repeat with pink glitter to create a 50/50 mix. 3. In the third liner pour a small amount of pink glitter and half as much gold glitter. Mix all 3 liners with wooden stick. 4. Fill in butterfly body with a thin layer of glue and cover with gold glitter. Shake off excess. 5. Use glue and sponge to coat the butterfly wings with a thin layer of glue. 6. You will work from the inside out. Sprinkle the innermost part of the wings with the glitter mixture that contains more gold glitter. Next to that sprinkle the 50/50 mix and finish the outermost part with the glitter that has more pink. 7. Let dry and apply it to the invite with a round foam adhesive. These are gorgeous. What a brilliant idea! Simply Beautiful! You outdid yourself - once again!